Ortigas is one of the busiest place in Metro Manila, the Philippines’ capital metropolis, populated with big malls, restaurants, schools, hospitals, and hotels; one of which is the 1-year old Jinjiang Inn Ortigas. Despite the busyness of the area, Ortigas is our go-to-place for meetings, both business and leisure. It’s also filled with a number of our favorite dining and shopping destinations, as well as for most urban Filipinos. 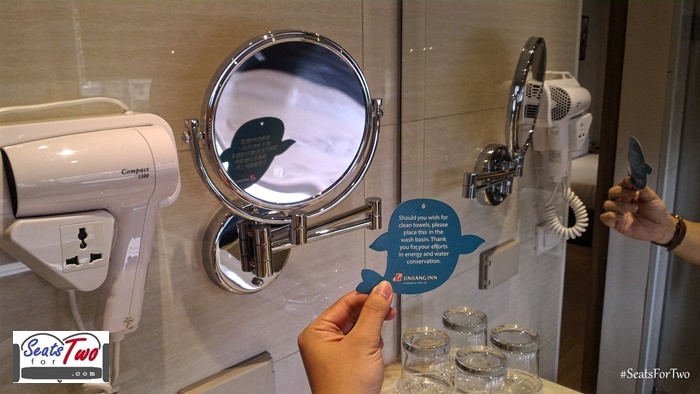 Recently, we were invited for a quick staycation at the relatively new Jin Jiang Inn Hotel, a business hotel located inside the Ortigas Business District. Upon our arrival, we were pleasantly assisted by Jin Jang‘s friendly front desk staff. The check-in procedure was quick, and they asked for the security deposit. 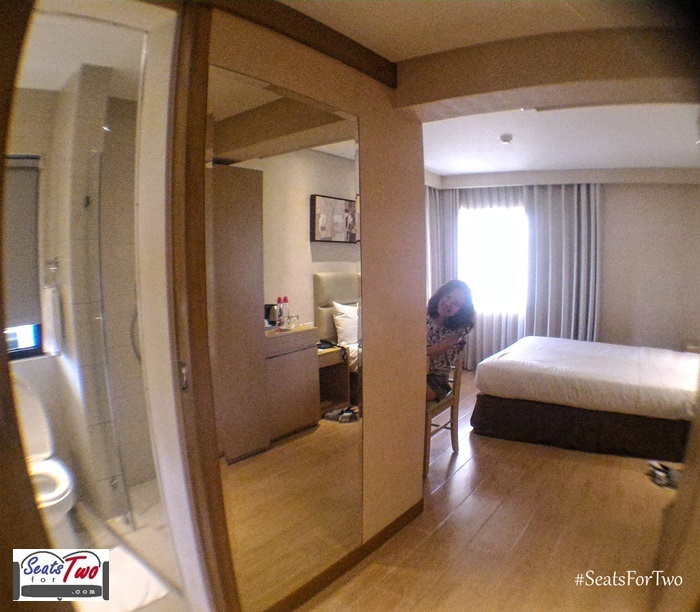 We stayed in one of their modern Business Suites with a queen-size bed. 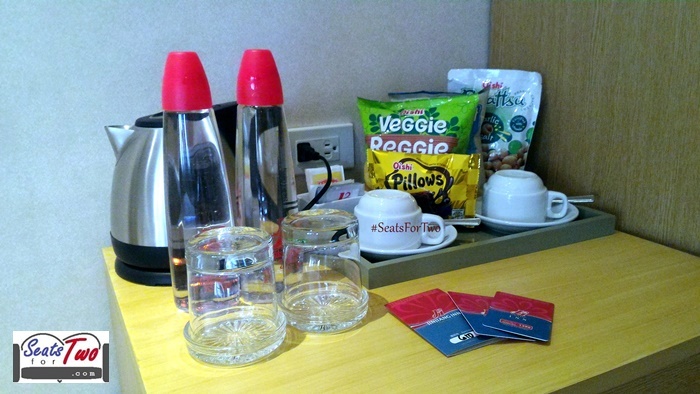 Our room had a personal refrigerator, LED television with cable, a work area, a complimentary bottled water, and a coffee & tea facility with which we were pleasantly surprised. 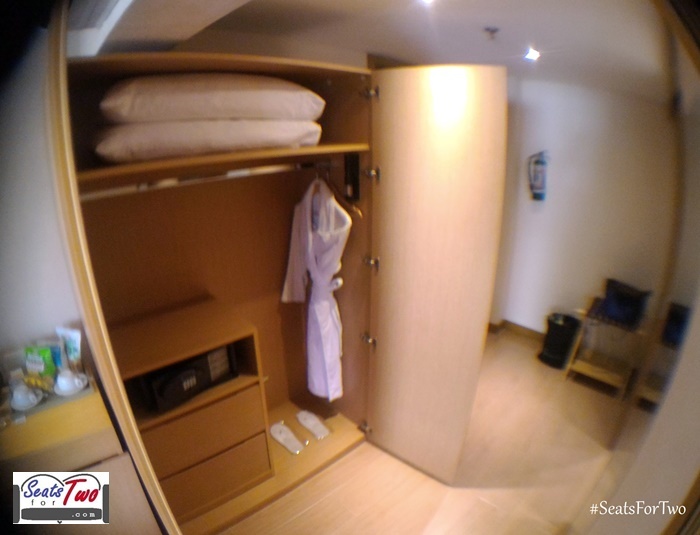 Moreover, the hotel room had a safety box, two bathrobes, and clean towels. And most specially, we were able to do some work care of the hotel’s strong Wi-Fi connection even from inside the room. Complete Closet Space: Bathrobe and Extra Pillows. The work area also offered two sides which we shared during our stay. 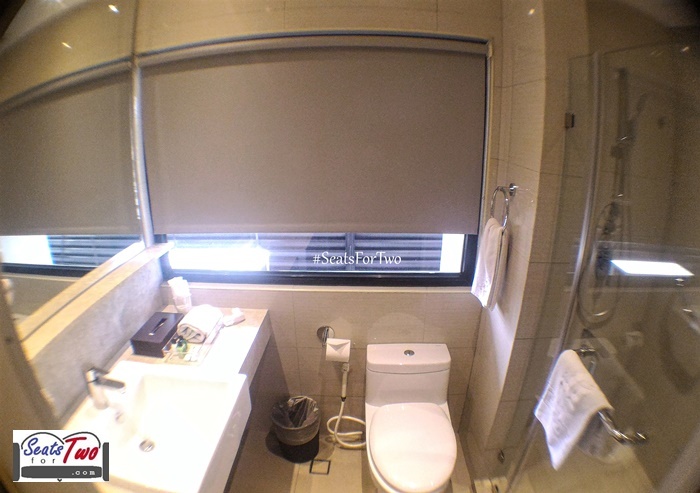 You might also opt to get a corner room to see at least two sides of the city. 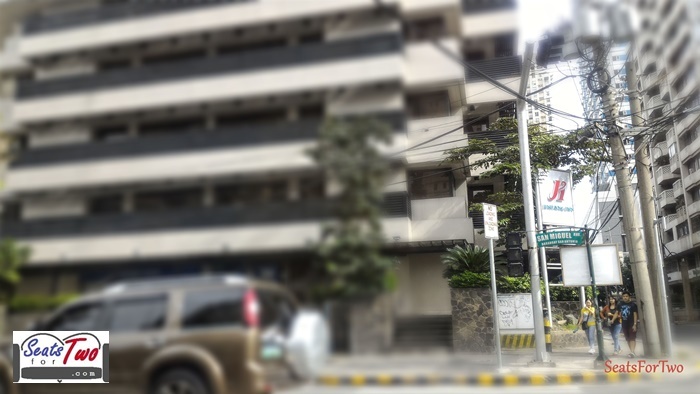 We had the views of San Miguel Corporation and the neighboring Richmond Hotel from our corner room. 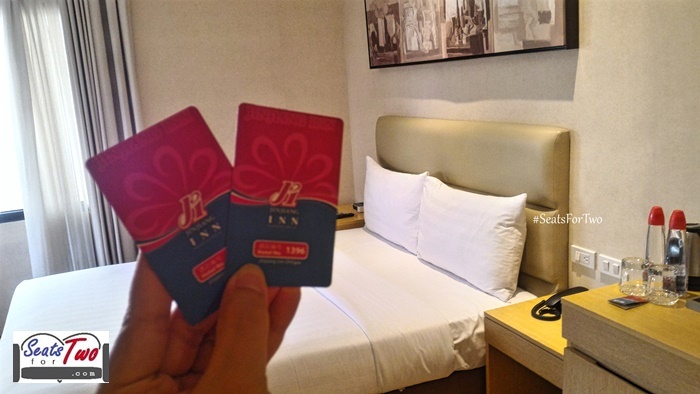 In general, Jinjiang Inn Ortigas houses 95 rooms with a mix of business room, business suite, triple room, and business twin room. Furthermore, the hotel has its own parking and restaurant called Five Spice serving various dishes ranging from Filipino to Chinese cuisine, and western fare as well. 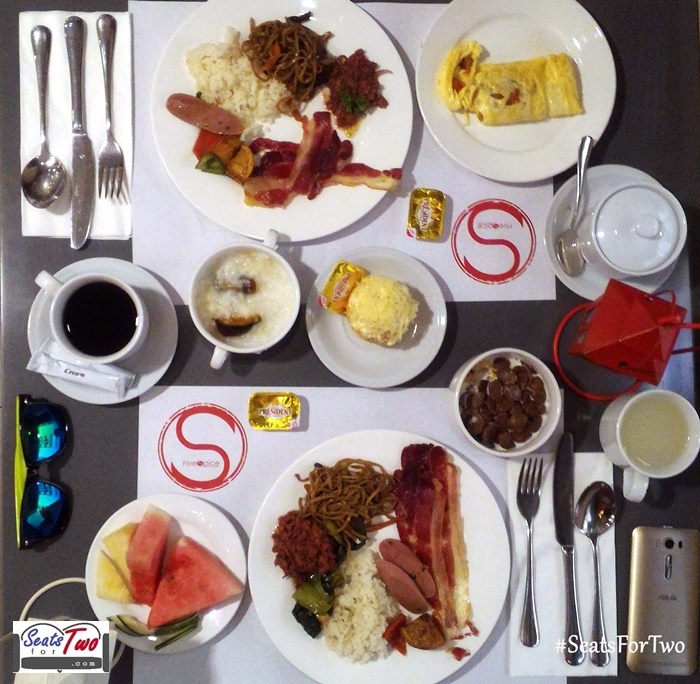 The breakfast buffet was a simple one comprised of the cuisines mentioned above, but it a good-enough set fit for a no-fuss business hotel. 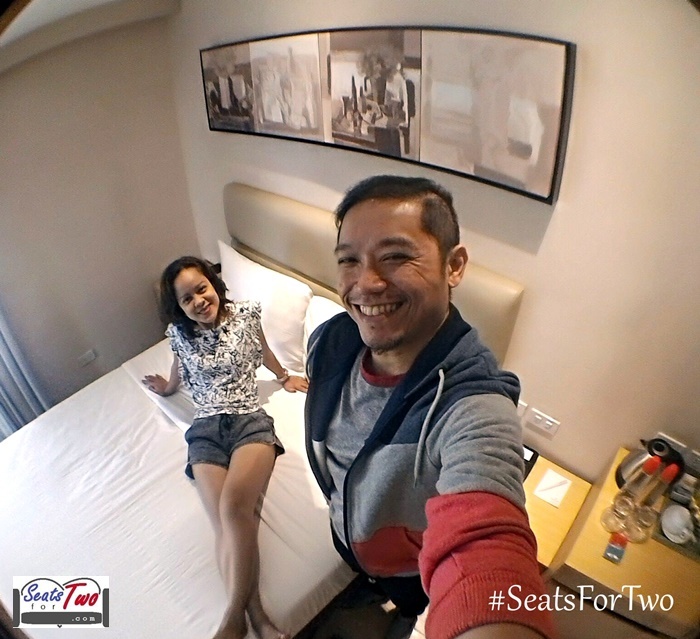 Follow more of our couple adventures through Seats For Two by subscribing to our blog through email and liking the Seats For Two Facebook Page. Follow our Twitter and Instagram accounts too! 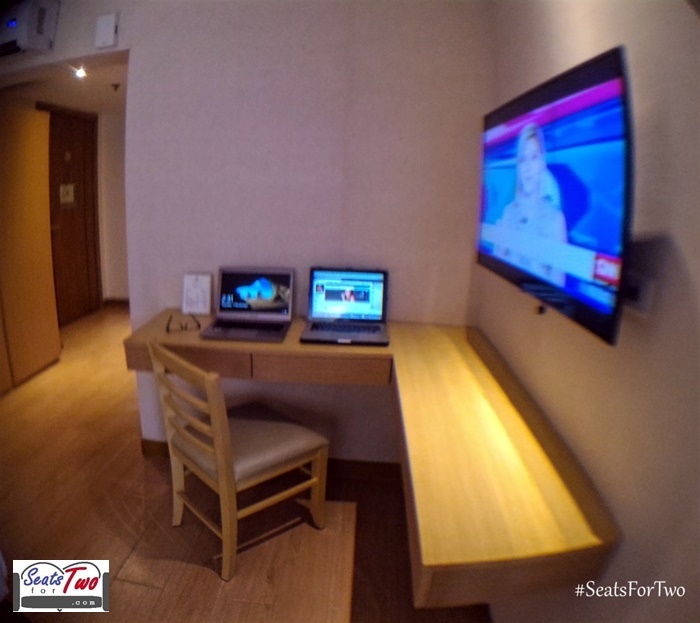 Seats For Two had a short, but sweet overnight at Jinjiang Inn Hotel in Ortigas. 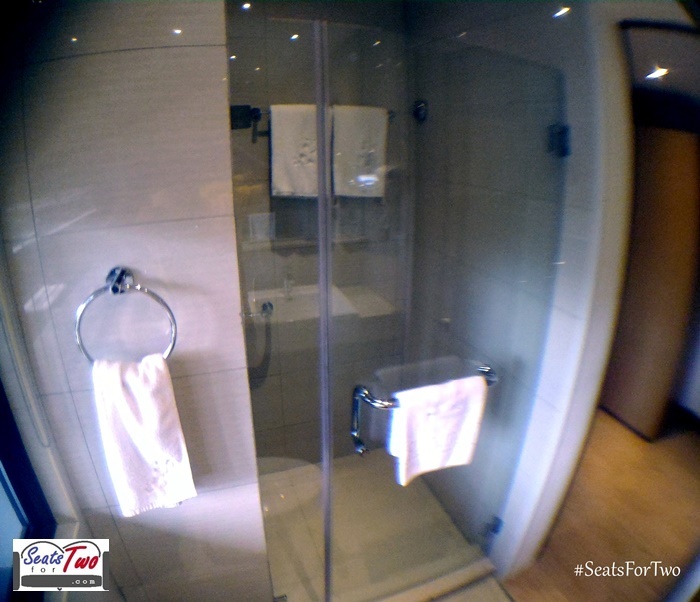 Their facilities caters to guests who are mainly staying for business purposes. But the good location that is Ortigas, will offer a lot of leisure options if you intend to do so such a malls, varied restaurants, and bars. Indeed, Jinjiang Inn’s prime location is an advantage for guests who works in Ortigas or is in town for a quick visit.